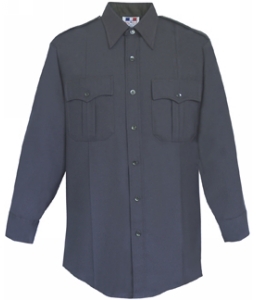 Flying Cross Long Sleeve Poly/Rayon/Lycra Deluxe Tactical | 201408, FLYING CROSS, Flying Cross Long Sleeve Poly/Rayon/Lycra Deluxe Tactical | McDonald Uniforms, Inc. Stretch the benefits of Fechheimer's ALl Weather Deluxe Tropical weave shirts with2% Lycra. The 68/30/2 Polyester/Rayon/LYCRA Deluxe Tactical, tropical weave shirts add stretch comfort to all the standard features of the Poly/Rayon shirts.